his is what used to be called a thriving market town. The market has long closed but the town still thrives. Outside Inverness nothing larger than a hamlet is of any antiquity in the Highlands. Some towns were created by a local grandee, others grew up when the railway came through, still others were settled by those cleared from the land. For its existence Aberfeldy must thank the duke of Atholl who failed to show General Wade the respect to which he felt he was entitled and, in 1730, this led the bridge spanning the Tay to be built here rather than at Dunkeld. 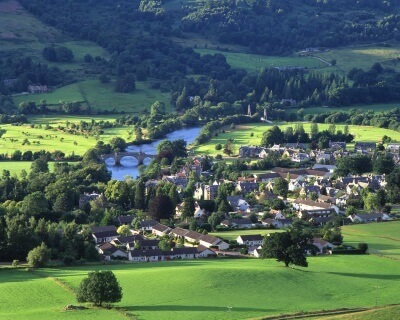 Before that Aberfeldy was just one of the little farming townships scattered along the sides of the strath. Most authorities give the origin of the name to 'Mouth of St Palladius' burn'. But it has been pointed out that Palladius never visited Scotland and thus is unlikely to have lived in the Den of Moness as his adherents suggested. A more likely inhabitant to have the town named after him was Paldy, King of the Urisks, who inhabited the falls at the top of the Birks. Urisks were large, strong, uncouth, grumpy beings - half man half goat - who lived by water and loitered round farmyards at harvest time hoping for hand outs. Paldy would have prospered for he could pop out the top of his falls and scrounge round the regular market at Margmore which served this once heavily populated area. Paldy and his subjects were enjoying a ceilidh in a shed above Loch Tay when they were gatecrashed by a shepherd. This gave them such a fright that they all emigrated from the district. The town motto reads in Gaelic 'Swift and often goes the boat of Aberfeldy' but the ferryman must have been less than pleased when the great bridge designed by William Adam was thrown across the Tay. For the building of his bridge Wade is said to have based himself at the inn at Weem and it was from there that he organised the Independent Companies to police the Highlands and prevent cattle theft. Officered by Campbells and other clans of proven loyalty, the Companies attracting the young gentry of Atholl who joined as private soldiers bringing their gillies with them to look after their kit. The Companies were the foundation of the Black Watch, the Royal Highland Regiment, which first mustered here by the Tay in 1740. Neither the bridge nor the Companies quite worked as Wade intended. The bridge, like the roads, was certainly built and used by the military but it was the soldiers of Prince Charles who crossed and re-crossed it during the Rising, and it was graduates of the Companies who provided a core of skilled officers for the prince's army which so nearly overthrew the state. The monument by the bridge was raised to the Black Watch in 1887 and the sad soldier on the top is based on Farquhar Shaw. He and a brace of Macphersons were shot at the Tower of London in 1743 for being ringleaders in a regimental mutiny. They had been recruited on the understanding they would stay in Scotland. When the authorities marched them down to London and prepared to ship them abroad, the regiment decided to return home but surrendered peacefully to the dragoons sent after them. Not a building in Aberfeldy dates from the time of the bridge. Moness House, now a hotel on the southern edge of the town, was the mansion house of the long defunct Flemyngs of Moness. Their daughters spiced the genes of many local lairds but, soon after completing the house in 1753, the male line of the family died out. During the late eighteenth and early nineteenth centuries the biggest cash earner for the Highlands was the distilling of whisky. The Dewars, originally the keepers of the sacred relics of St Fillan, emerged from the ranks of dozens of illegal whisky makers in Atholl and Breadalbane to build the distillery just to the east of the town, gain a peerage, move into a castle, and found Distillers Company Ltd. You can buy the Aberfeldy Malt at the Visitor Centre, but, save for those few bottles sold locally, all the product goes to add quality to Dewar's blended brands. The Moness burn joins the Tay through the golf course. Behind the war memorial in the centre of town it runs through woods and lawns. Follow its course upwards and you enter the Den of Moness, a cathedral of giant beech trees. Above here, the burn has carved a gorge and along with its tributaries crashes down through the ancient woodland in a myriad of cascades. By one of these is a convenient, if invariably damp, ledge of rock where, so a plaque tell us, Robert Burns sat and wrote his song 'The Birks of Aberfeldie' which forever set this place amongst the official beauty spots of the nation. A path winds up each side of the ravine, crossing above the high falls where Paldy the Urisk once lived. In summer the water gently streamers down the face of the cliff. After winter rain it turns peat-brown, grows a hundred-fold and thunders into its cauldron shaking the solid rock of the gorge side. In late afternoon when the storm has passed, the sun paints rings of rainbows in the cataract's spray.